Nickelodeon cartoon SPONGEBOB SQUAREPANTS is getting ready for its Broadway debut following its engagement in Chicago next year. A whole host of artists have been signed up to write songs for the production including DAVID BOWIE, who apparently is writing ONE song, with additional lyrics by Jonathan Coulton. The full list of composers announced today are: Steven Tyler and Joe Perry of the band Aerosmith, Cyndi Lauper, They Might Be Giants, Jonathan Coulton, Dirty Projectors, The Flaming Lips, John Legend, Lady Antebellum, Panic! At the Disco, Plain White T's, and T.I., with an additional song by David Bowie and additional lyrics by Jonathan Coulton. The SpongeBob Musical will begin its tryout on 7th June 2016, at Chicago's Oriental Theatre until 3rd July. It will then move on to Broadway at a date and theatre to be announced. Update: (8th October) David is contributing 'No Control' from his 1. Outside album. MILEY CYRUS has released a free downloadable album 'Miley Cyrus & Her Dead Petz' which contains the track 'Twinkle Song'. Tickets are on sale NOW for the upcoming DAVID BOWIE Is exhibition at Groninger Museum, 9711 ME Groningen, Netherlands. The exhibition opens 11th December through to 13th March 2016. To book your online tickets and time slots simply visit tickets.davidbowie-groningen.nl website. Running from 9th September through to 11th October at the Taschen Gallery, 8070 Beverly Blvd, Los Angeles, CA 90048, United States. For more details and information please visit the taschen.com website. davidbowie.com have announced the next DAVID BOWIE 40th Anniversary Picture Disc 7" Single will be Space Oddity scheduled for release on 2nd October. As you can see, the A-side picture features the 1969 Philips French picture sleeve, complete with original typo error. Space Oddity (UK single edit). Arranged by David Bowie and Paul Buckmaster. Wild Eyed Boy From Freecloud (single B-side with spoken introduction). The AA-side picture features a beautiful Vernon Dewhurst 1969 photograph. This release is available to pre-order NOW. Then the following month on 13th November sees Golden Years getting the 40th Anniversary treatment. Station To Station (Single Edit). Both photographs appearing on the A and AA sides contain shots by Steve Schapiro. Just published is the Kindle edition of 'I PLAYED ZIGGY'S GUITAR' by David Colworth - and it's absolutely FREE to download! Synopsis: It's England in the early 1970s. A nation engulfed by strikes, power cuts and endless economic crisis. The Beatles are gone, the Swinging 60s are a distant memory and the music scene is moribund. But help is on its way - far out in space, Ziggy Stardust is coming to save Planet Earth! Read how a teenage fan follows Bowie from obscurity to international stardom, with a fascinating account of how he came face to face with Bowie just weeks before his breakthrough, at a crucial point in his career. If you've ever wondered who was the boy in the bright blue jeans who jumped up on the stage to join Bowie and his band, this book will reveal all. At last, the true story of how one fan achieved his dream - and played Ziggy's guitar! Download your FREE Kindle version of I Played Ziggy's Guitar NOW. Talking of books... I'm sure everyone has seen David Bowie's Top 100 'Must Read' Books. I've now updated the list with a synopsis of each book and fixed the typos (yes there were several on the original list). Take a look through his recommendations and see how many you have read. Personally, I'm nearly half way through and enjoying myself thoroughly. 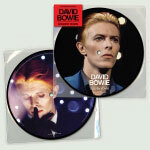 davidbowie.com have announced details of two new exclusive DAVID BOWIE vinyl releases to coincide with the opening of the David Bowie Is exhibition at the Groninger Museum, Groningen, The Netherlands. 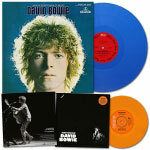 The limited edition Parlophone releases are: David Bowie (aka Man of Words/Man Of Music) blue vinyl album and Amsterdam 7" orange vinyl single. Both of these will only be available at the exhibition and are scheduled for release on 11th December. (Jacques Brel/English lyrics: Mort Shuman). Produced by Ken Scott and David Bowie. Recorded live at Carnegie Hall, New York on 28th September, 1972. The front cover photograph is a previously unpublished shot by Brian Ward, and the reverse cover is a live shot from Carnegie Hall, 1972 by David Gahr. Update: Both releases will have 1,500 copies of each pressed. A DAVID BOWIE Convention is taking place on 29th August at The Kings Arms, in Salford, Greater Manchester. The venue, located at 11 Bloom Street, M3 6AN is only a ten-minute walk from Deansgate from the centre of Manchester. The Kings Arms are pleased to announce their 2nd ever convention - this time a David Bowie Convention! It will be a day full of all things David Bowie! Tribute band, The Bowie Experience will be performing a brilliant set of all the Bowie classics and more! There will also be a Bowie inspired play, written by Mike Heath especially for the convention. Plus a special performance from the wonderful Die Hexen and the amazing Ed Glinert from New Manchester Walks will be doing a Bowie presentation. Michael J. Dawson will be presenting a short video reading from the book 'Life on Mars' followed by a 15 minute Q&A with the author himself. To end the day we'll be having a Bowie disco. Also, beer fans can indulge in their Bowie themed beers! Food for the day will be included. For tickets and more information, pop on over to the kingsarmssalford.com website. 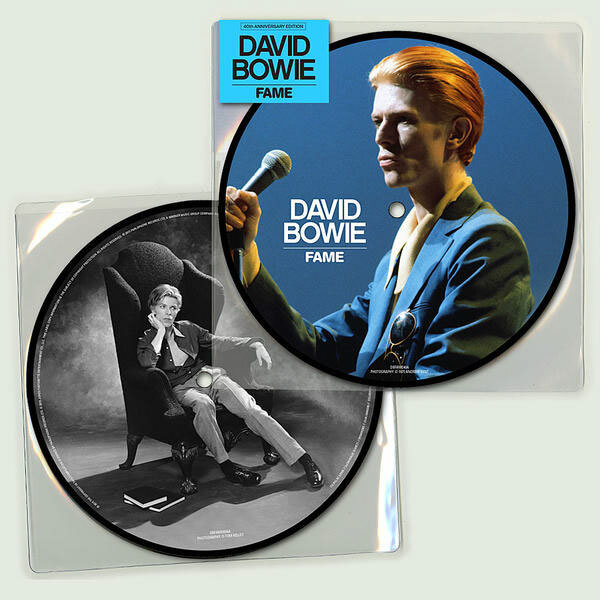 The DAVID BOWIE 40th Anniversary Limited Edition Picture Disc Single release of Fame has hit the NUMBER ONE spot in the UK Official Vinyl Singles Chart. It entered the UK charts at number two on the first week of release. 'Fame' was co-written with John Lennon and guitarist Carlos Alomar and originally it hit the U.S. number one spot back in September 1975. His first-ever US chart-topping single. Update: Now extended until 30th September... Opening today at the KRANZBERG ARTS CENTER in St. Louis is Sound & Vision - An Art Tribute to Rock & Roll. 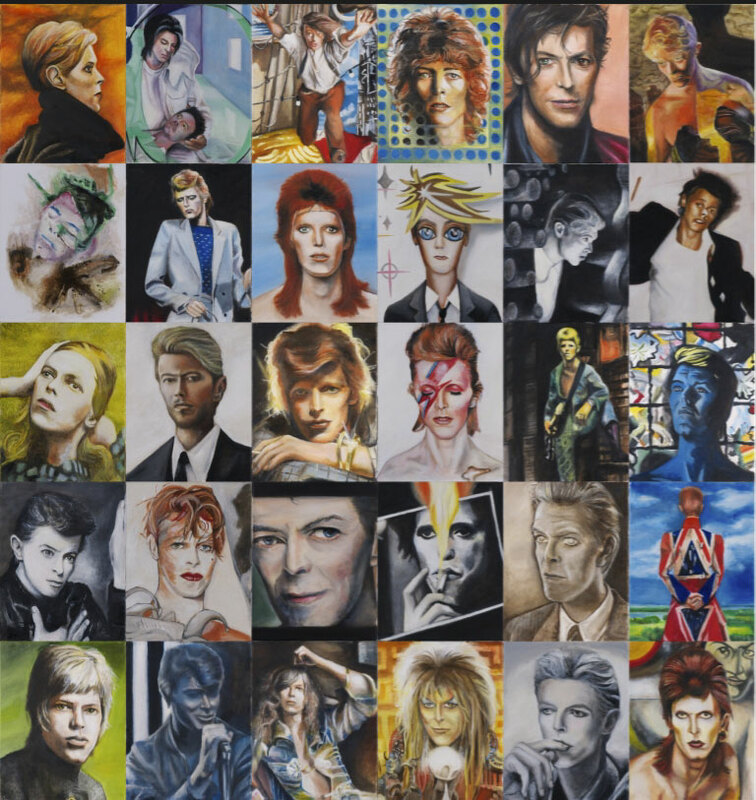 Part of this art exhibition is 'FiftyOneBowie' which contains 51 DAVID BOWIE portraits by artist MARK DETHROW. Fifty-one years ago iconic rocker David Bowie released his first single, 'Liza Jane,' under the name Davie Jones with The King Bees. Since then, Bowie has proven himself to be one of the most visually fascinating figures of our time. With FiftyOneBowie, artist Mark Dethrow draws inspiration from the wealth of source material that has captured the chameleon performer over the course of his career. Expertly "borrowing" from concert photography and album covers, Dethrow has created fifty-one portraits that honor both Bowie and the many artists who have immortalised him. Open: 6pm-10pm. Admission FREE. Runs 7th August until 31st August. Venue Address: 501 N Grand Blvd, St. Louis, MO 63103, USA. More details and information can be found over at kranzbergartscenter.org website. 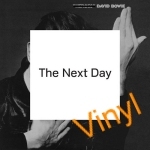 Released today is DAVID BOWIE: DAY IN DAY OUT Legendary Radio Broadcast, Australia 1987 via Laser Media. This 2CD is taken from the Australian FM radio broadcast during the Glass Spider World Tour at Sydney Entertainment Centre on 3rd November 1987. You can pre-order Day In Day Out Radio Broadcast (2cd) NOW. (Ed. This radio broadcast is NOT the same as the official video. It is taken from the previous night on 3/11/87). Taking place on Saturday 15th August is a 'Picnic around the Bandstand' at The Croydon Road Recreation Ground in Beckenham. From 1.00pm, weather permitting, please gather in small groups, but feel free to mingle. Acoustic instruments only. We need to be very well behaved in order not to upset The Friends of the Rec. Check out the Beckenham Bowie Facebook page for more details. Plans for Memory of a Free Festival 2016 are underway. As announced last month, legendary producer TONY VISCONTI will be the musical curator for this event. We don't yet know which acts Tony will select, but with his connections he probably has some interesting artists in his address book. 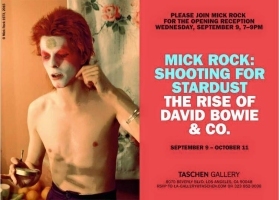 Legendary rock photographer MICK ROCK (aka "The Man Who Shot the Seventies") is to host a brand new TV series. Later today, ON THE RECORD WITH MICK ROCK premieres at 8.00 pm ET on OVATION. 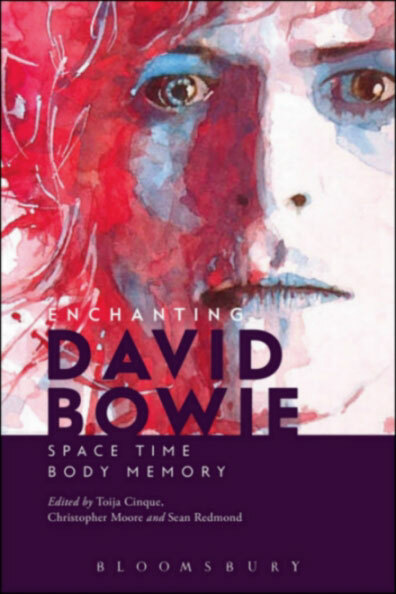 Just published is the brand new title ENCHANTING DAVID BOWIE: Space/Time/Body/Memory by Toija Cinque (Editor), Christopher Moore (Editor) and Sean Redmond (Editor). Available in three different formats: Hardcover / Paperback / Kindle, it contains 368 pages and published by Bloomsbury Academic USA. Synopsis: A longstanding, successful and frequently controversial career spanning more than four decades establishes David Bowie as charged with contemporary cultural relevance. That David Bowie has influenced many lives is undeniable to his fans. He requisitions and challenges his audiences, through frequently indirect lyrics and images, to critically question sanity, identity and essentially what it means to be 'us' and why we are here. Enchanting David Bowie explores David Bowie as an anti-temporal figure and argues that we need to understand him across the many media platforms and art spaces he intersects with including theatre, film, television, the web, exhibition, installation, music, lyrics, video, and fashion. This exciting collection is organised according to the key themes of space, time, body, and memory - themes that literally and metaphorically address the key questions and intensities of his output. Reviews: This scintillating collection considers David Bowie's contemporaneity, showing how the star looks very different today - and how every different Bowie is a hero, if just for one day. With each chapter like a crystal ball ricocheting around a multi-level labyrinth, Enchanting David Bowie is full of surprises and delights for the fan and scholar alike. - Christopher Schaberg, Associate Professor of English, Loyola University New Orleans, USA, and author of 'The Textual Life of Airports' and 'Deconstructing Brad Pitt'. Consider for a moment, David Bowie's extraordinary body of work, not just the music, but also his assimilation of different media practices: writing, painting, performance, film and video. This volume coheres around four thematic vectors - space, time, body and memory - to interrogate Bowie's remarkable corpus of cultural production. In the process, Enchanting David Bowie - itself a standout work - not only illuminates but also construes 'Bowie' - or versions of Bowie - that are at once compelling and fascinating. - Constantine Verevis, Associate Professor of Film and Screen Studies, Monash University, Australia. You can purchase Enchanting David Bowie: Space/Time/Body/Memory NOW. On this day in 1971, David Bowie performed for the first time at what was then known as the 'Glastonbury Fair'. 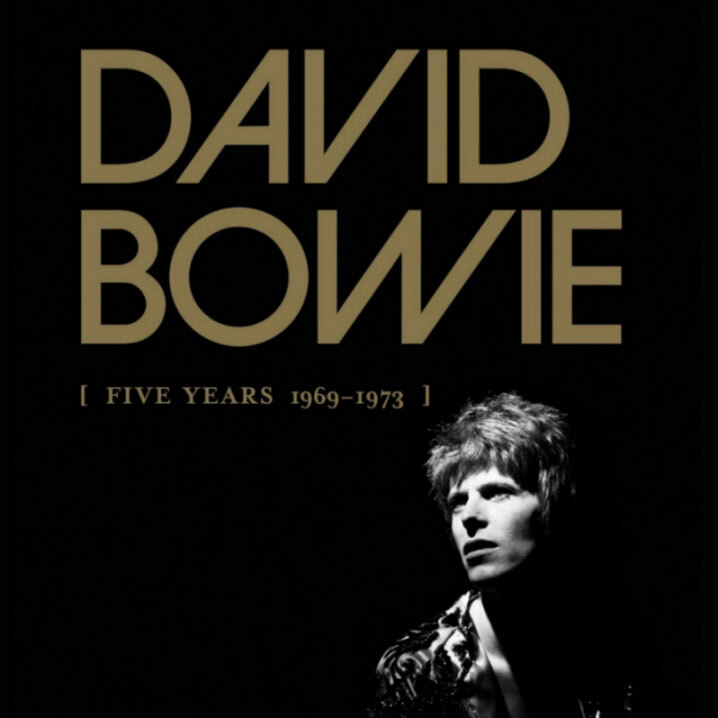 Today in 2015 as the Glastonbury Festival approaches once more Parlophone Records are proud to announce DAVID BOWIE FIVE YEARS (1969-1973) the first in a series of box sets spanning his career. The ten album / twelve CD box, ten album / thirteen-piece vinyl set and digital download featuring all of the material officially released by Bowie during the nascent stage of his career from 1969 to 1973. All of the formats include tracks that have never before appeared on CD/digitally as well as new remasters. Exclusive to the box sets will be Re:Call 1 a new 2-disc compilation of non-album singles, single versions and b-sides. It features a previously unreleased single edit of All The Madmen, which was originally set for a U.S. release but was never actually released. Also included is the original version of Holy Holy, which was only ever released on the original 1971 Mercury single and hasn't been available on any release since. 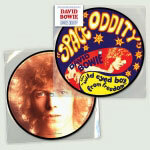 Also exclusive to all versions of Five Years 1969-1973 will be a 2003 stereo remix of 'The Rise and Fall Of Ziggy Stardust And The Spiders From Mars' by the album's original co-producer Ken Scott, previously only available on DVD with the LP/DVD format of the 40th anniversary edition of the album. The vinyl box set has the same content as the CD set on pressed on audiophile quality 180g vinyl. The box set's accompanying book, 128 pages in the CD box and 84 in the vinyl set, will feature rarely seen photos as well as technical notes about each album from producers Tony Visconti and Ken Scott, an original press review for each album and a short foreword by legendary Kinks front man Ray Davies. The CD box set will include faithfully reproduced mini-vinyl versions of the original albums and the CDs will be gold rather than the usual silver. An alternate cover has been created for the 2003 mix of Ziggy Stardust by Ken Scott, which features an outtake from the original Heddon Street photo session. There is also newly originated artwork for Re:Call 1 featuring a 1973 in-studio image from renowned photographer Mick Rock. The vinyl box set has the same content as the CD box set pressed on audiophile 180g vinyl. DAVID BOWIE 'FIVE YEARS 1969-1973' is released 25th September on Parlophone Records. You can pre-order Five Years (1969-1973) CD and Five Years (1969-1973) VINYL NOW and receive guaranteed pricing. I have several DAVID BOWIE Is collectors items available... including the 'David Bowie Is Walking In Soho' Fold-out Maps and 'David Bowie Is Missing' Print Poster (10x15 inches, rare and never on sale to the general public). If anyone is interested in any of the items, please email me at for more details and information. Big thanks to everyone who have made purchases - it's much appreciated. All monies raised go directly towards the running costs of this website. Brand New DAVID BOWIE FIVE YEARS 1969-1973 Box Set scheduled for release on 25th September via Parlophone Records - you can pre-order CD version and VINYL NOW and receive guaranteed pricing. SPACE ODDITY 40th Anniversary Picture Disc 7 Inch Single to be released on 2nd October via Parlophone - you can pre-order NOW.